Posted on October 16, 2015 in Industry by Emily E. Steck. Part of the appeal of content marketing is that your brand is offering another value other than the service or product to its consumers. Instead of just providing X, content marketing allows brands to provide content and, thus value, for free. In order to be considered “pure” content marketing, the content must stand on its own and add editorial value, not advertorial. But there are some markets that say otherwise. The traditional magazine industry’s dire state has lead to a bleeding of commerce and content, often yielding mixed results. For branded publications like ASOS, a British online fashion and beauty store aimed at the 18-34 crowd, this means newfound success in print and online. Fast-fashion brand ASOS, which stands for As Seen On Screen, takes its name literally. 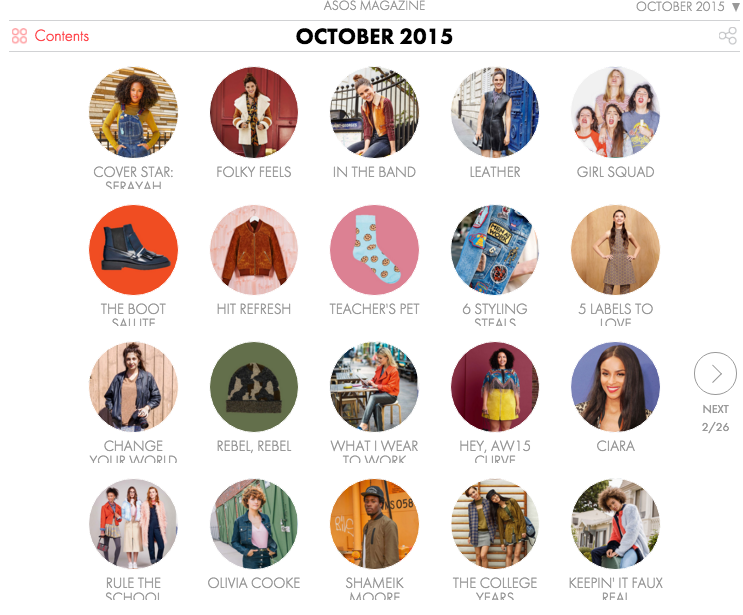 In their self-titled print and online publication, every issue of ASOS Magazine features sales items from their website that month. Unlike other branded publications, ASOS is not in the business of making a “coffee table” magazine. Yes, flipping through the glossy pages of this print magazine is satisfying, but ASOS follows its fast fashion ethos to deliver magazines that appeal to the here-and-now type. Or more importantly, the type inclined to buy what’s in ASOS’ pages each month and eagerly await for next month’s picks. E-commerce is often considered the magazine industry’s golden opportunity to make money on magazines. In an interview with Flash and Flames, former ASOS CEO Nick Robertson explains the importance of content: “The first pound of marketing an online business goes into delivery and returns, and we spend £100m a year on making that free. The second pound goes into how best to represent ASOS. 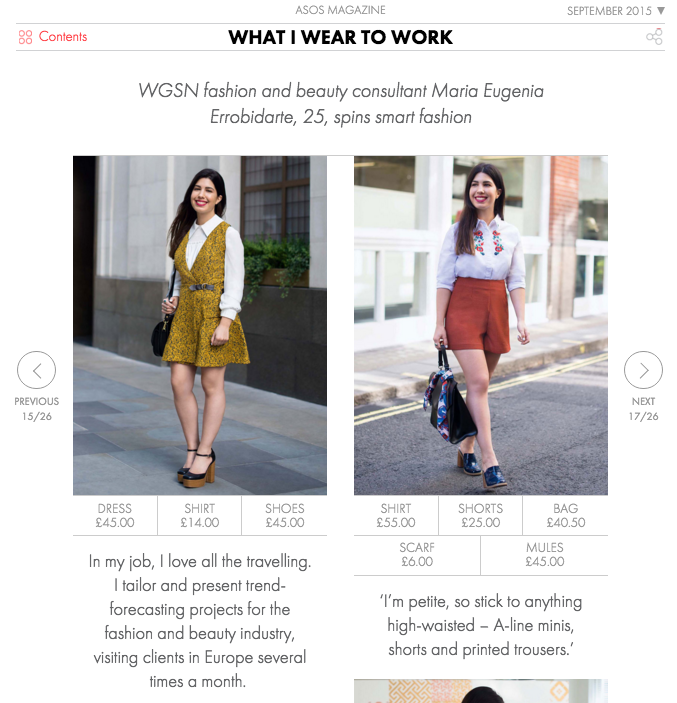 So we use content: our emails, the fashion magazine, the mobile app. The convergence between retail and media, this is it. The business model for magazines, that was made up of advertising revenue, is now clothes sales.” To note, however, is that ASOS does sell advertisements in their magazine though it seems to be powered by e-commerce. For users who download the magazine to their mobile device or peruse it at leisure online, it’s incredibly easy to directly buy the fashion products from the 15-year-old fashion brand, giving it a leg up on its competition. Fashion magazines like Cosmopolitan have to use third party companies like Shop Advisor to sell what’s in their magazine. Make no mistake though—ASOS Magazine is still an editorial product. “We do showcase product and that’s very important, but in ideas meetings, it’s not driven by product launches,” said associate editor Marina Crook. “It’s more about what’s important at this time of year. We work in tandem with the retail team.” What could be just a glorified catalogue is supported by strong editorial content typical of their competition compiled by an in-house team. With forays into fashion trends, beauty how-tos and interviews with actors, activists and fashionistas, it doesn’t feel out of place at now-dying newsstands. Perhaps the branded magazine’s most impressive feat is convincing Hollywood starlets like Jennifer Lawrence, Taylor Swift, Lady Gaga, Claire Danes and Lea Michele to grace its cover. According to Fashionista, the brand and magazine acquired such A-list cover stars by targeting up-and-comers to grace the cover; this momentum eases the concerns for other starlets to sign on. The company declined, however, to clarify if there’s monetary compensation to secure talent, insisting that they proceed the same way as other magazines do. With 10 issues a year available for free online and off (though only ASOS Premiere customers are delivered the print edition), ASOS Magazine is a branded publication blurring the lines between e-commerce and editorial in its part-catalogue, part-newsstand-worthy magazine. Branded publications must strike a careful balance of editorial and e-commerce. Otherwise, it is just a catalogue. ASOS fixed this problem by enlisting A-list talent and strong editorial pieces. Online e-commerce-driven magazines can pinpoint the “success” of the branded magazine. For instance, if someone is looking at the magazine online and clicks through to purchase, that’s a clear indicator of success. With standalone print magazines, it’s harder to see the magazine’s ROI, instantly. Magazines with an e-commerce business model can still sell advertisements to supplement the costs. With a “catalogue calendar,” brands must decide if they want their print magazines to be ephemeral or for coffee tables. Choosing between the two will greatly determine cost, circulation, distribution and frequency. In a marketplace where everyone is on every content channel, these digital-first publishers are committing themselves to print to stand out from the pack. _Net-A-Porter_'s—world's premier online luxury fashion retailer—print magazine _PORTER Magazine _is an extension of the brand's luxury fashion. Equipped with high fashion editorials, photography and shopping opportunities, the part-magazine, part-catalogue runs thick with an average of 300+ pages. With six annual issues for $25/$35 a year, it's one of the best "steals" for digital-to-print magazine prices. 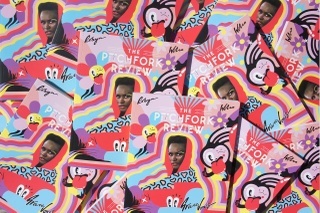 Pitchfork—a music publication—launched _The Pitchfork Review _in 2014 as a 200-plus page quarterly magazine. Featuring longform journalism, photography, reviews, interviews, design and comics, the print magazine hopes to encourage readers to collect their magazine like they would a vinyl record. That explains why the price of the print magazine is on the expensive side, costing $20 an issue or $50 for a year. Consumers can also buy the magazine at select bookstores in the United States. CNET—one of the oldest and largest online tech publications—launched a print quarterly magazine in late 2014 simpled entitled _CNET Magazine, _where it hopes to reach audiences offline with the latest tech journalism. "The idea from the outset was that _CNET_ did not want to be a tech insider publication. That's not what we do online. We're a consumer-focused tech site. Once you understand that's what we're trying to do in print, it becomes clear that there's not tech mainstream consumer magazine in the marketplace," said the site's co-editor in chief, Connie Guglielmo to [Mashable. ](http://mashable.com/2014/11/03/cnet-quarterly-magazine/) Taking the subscription-based model—$10 for 4 issues a year via online or found in book retailers—the magazine is set to circulate 200,000 copies. _The Red Bulletin—_Red Bull's branded magazine—has carved itself a place in the men’s lifestyle market via compelling sports photography and editorials (more on that [here](http://blog.quiet.ly/industry/what-gives-red-bull-its-wings-its-branded-publication-the-red-bulletin/)). In addition to their online blogs, social channels and editorials, they publish their branded magazine for free.